You are a Permanent Cosmetics Technician, why not look the part? Wearing this premium smock will help you present yourself to clients and colleagues as the professional technician you are. Each smock is embroidered with the Permanent Make Up Products Logo and is made of crinkle lightweight nylon for easy movement. 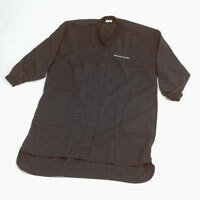 These lab coats have snaps and black elastic cuffs and are very easy to wash and dry. Protect your clothing and look great when you wear this Permanent Makeup lab coat! Book: "Permanent Cosmetics: The Ultimate Guide for the Professional Technician"
This groundbreaking book is a must-have for every Permanent Cosmetics technician. Written by Susan Church, "The Ultimate Guide for the Professional Technician" is filled with critical information, techniques and advice about every procedure imaginable.